To leave a review – please click here. Thank you so much for your support and time. 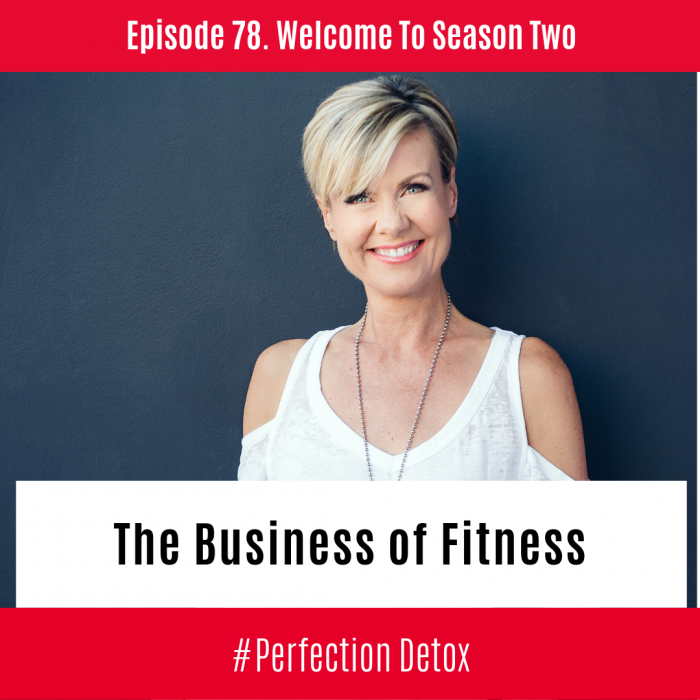 This is a short show to introduce you to Season Two of The Perfection Detox Podcast: The Business of Fitness. Whether you are in fitness full time, some of the time or none of the time, the wisdom, inspiration, and encouragement you will find from my guests, along with the tips, strategies, and ideas they will share on how you can elevate and expand your reach, will have you feeling empowered and energized. Before becoming a speaker, author and podcaster I spend thirty plus years in the wonderful industry called fitness – and because for many of us, our passion is tied so tightly to our paycheck we sometimes can lose sight of the bigger picture. Whatever type of creative you are and whether you work for yourself, for a company, or are still figuring out what you want to do when you grow up, I hope that you will find nuggets of gold within these conversations. Strategies that will help you continue to move forward into your greatness and goodness. We have 24 guests that are about to share their wisdom and knowledge. Nothing is held back, and their sole goal is to help you rise. Not only are these experts in their field and change makers in their industry – they are compassionate, generous and amazing human beings, who are just as kind and generous when no-one is looking. Once I hear from enough of you that you are ready for the next episodes, I will release the next six conversations, and so on, until all 24 are out into the world. Then it will be time for Season Three: The Business of Entrepreneurship. Let me know your questions, feel free to share a short message on how a particular nugget or guest inspired you, or let me know what skills you use, to impact, influence, and inspire those around you. When leaving your message or email be sure to let me know if I can use your voicemail and name on the show as I would love to share your voice with the Perfection Detox podcast community. To purchase The Perfection Detox Book click here.